Our Highway Series is a truly over-the-road mobile bleachers. The design of these units allows the maximum potential of their seating. Outdoor Aluminum’s Highway Series consists of a maintenance-free aluminum understructure, seat planks, foot planks, and guardrail system that is then made an integral part of a hot-dipped galvanized trailer assembly. 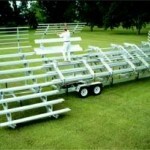 This feature, coupled with the ability of these units to quickly and easily go from their towing position to fully set up and ready for use, make them a most versatile seating system. A Highway Series unit can be used for spectator seating at an event and only minutes after the event has ended be on its way to yet another event across campus, city, town, or state. Complete specifications are available upon request.